Internet connection becomes “must-have” resource in daily operation. When company managements have security concert about housing their database and financial records out of its premise, availability would always come into their mind. Typical solution would install a backup circuit with same or different provider. Typical service providers cannot offer client their competitor circuit or service. This handicap their reliance circuits and service in fundamental way. Even they can provide two circuits with “so-called” connect to different two sub-stations, but both circuits are still provided by same provider. When you consider to use two different providers, there would be technical issues need to be resolve. For example, installing expensive load balance appliance, manually changing domain name records and IP address, in-person to swapping primary circuit to backup etc… Sometime it may require you to change your IT infrastructure completely to achieve auto failover. The circuit combination is limited by the actual resource of the client premise. 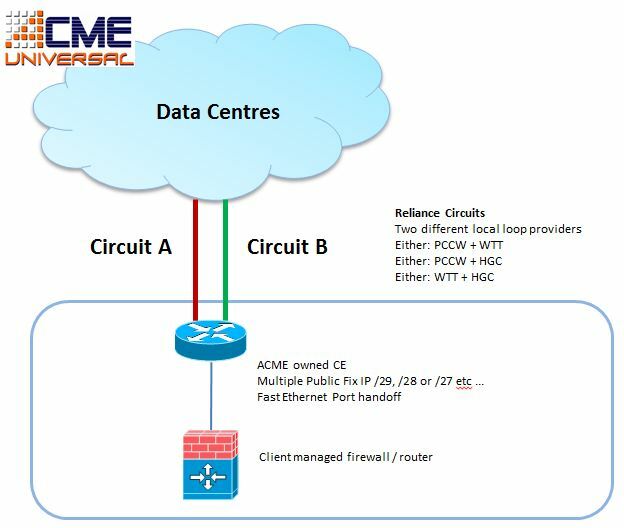 ACME reliance circuit solution is not just for enterprise connectivity such as MPLS or cross-broader circuit. Our reliance solution is unique. SMB can also benefit without huge investment and a lot of IT skill “know-how”. 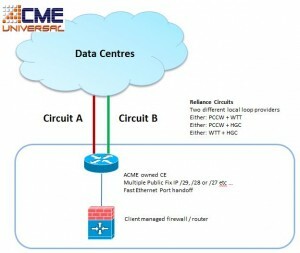 ACME can offer two different circuits from two different service providers such as Hutchison Telecom, PCCW, Wharf T&T, New World Telecom and assign ONE set of IP addresses. The circuits will connect to our data centre network. By doing this, all the traffic will auto failover to backup line when one of circuit is disconnected at client end. And typically user will not able recognize the changeover. Real reliance by using different local loop provider. Other service provider would provide reliance circuits but both circuits are come from same company. No special skill needed from client end. Normal router/firewall setting would be fine. In case of the network congestion in sole local ISP, we can select alternative path by switch the traffic to HGC, WTT or others upstream carriers.